Vaasa Wind Exchange & Solar is an event arranged as part of the Vaasa EnergyWeek. About 1000 visitors visited the event, and there were 64 exhibitors, both national and international. Kvarken Ports’ Managing Director Matti Esko presented the port, together with Vasek’s Logsitics Experts Riitta Björkenheim and Anna Måtts who represented Midway Alignment. – This is a truly great place to present Vaasa’s and Umeå’s cooperation and the infrastructure project Midway Alignment. Here today we highlight already made improvements, as for example the cities’ joint port, Kvarken Ports says Matti Esko. – Logistics and infrastructure are vital when talking about development and it is important to have a continuous discussion together with the industry. This ensures for example transport of our energy cluster’s components, says Anna Måtts. The importance of the infrastructure was also emphasized during the opening ceremony when Pierre Tardieu, EWEA – European Wind Energy Association, talked about EU’s challenges and aims regarding energy. He listed logistics as one of the five biggest challenges. – Here we can network and present our expertise to decision makers and potential partners. Moreover the event gives us the opportunity to talk about the alternatives we can provide and at the same time get updated information on renewable energy issues, says Riitta Björkenheim. – The atmosphere is great, satisfied exhibitors and interesting discussions. I have already had several important discussions during the first day, and it is really impressive to see that EnergyWeek has grown into a truly international event, notes Björkenheim. Picture: Wim Stubbe discussing with Matti Esko and Anna Måtts about small and medium sized ports as hubs for smart growth and sustainable connectivity. Vaasa Wind Exchange & Solar 2015 was arranged for the fifth time. 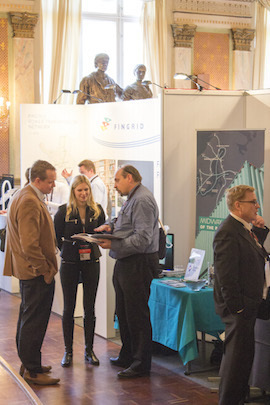 EnergyWeek 2015 had over 2000 preregistered visitors, of which amazingly 20% came from outside the Finnish borders.